Long-lasting Google search rankings you can depend on. 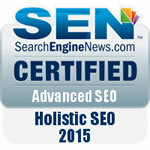 Why Holistic Search Engine Marketing? Book a free consultation with Jenn, to find out how we can help you get top rankings and traffic built on a solid foundation. Tell us about your site and book your free 30 minute consultation with Jenn. Jenn was an absolute asset with her breadth of knowledge, easy to understand practical applications and her pleasant demeanor. She helped us with SEO minded designing, Google Analytics, keyword research, rankings and lot’s more. We would highly recommend her to anyone who needs assistance in the SEO world and I personally look forward to working with her again in the near future.